The poems didn’t shrink from the hard emotions either. 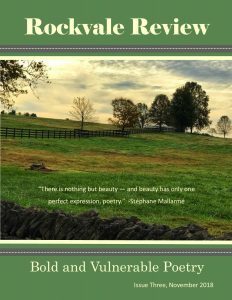 There were themes that seemed to spar with faith – those poems that lived within loss, brokenness, fear, loneliness, cruelty, death. It was almost as if a tender balance was being built between the realms of human existence, between what harms and what heals, what questions and what answers. As a visual artist, and a visual learner, I had to see in concrete form what I was sensing. I printed every accepted poem and lay them on the floor, rearranging as I went. You won’t believe me if I said what happened was magical, but maybe you’ll believe these poems led to each other, leaned into each other, and the connections and parallels were palpable. I challenge you to hear how “Dishes” and “If Plates are Shirts are Milk Jars” whisper together, how “Café Talk” parallels “Miss Main Street Bridge, 1951” across the generations, which in turn parallels “High Tide at Avon Beach.” I urge you to experience how “Postscript” is comforted by “The Wind Knows the Origin of the Universe,” and how “Shooting Picture” reveals “Dear Officer.” Let yourself experience “Fence” layered with “renovated bodies”, and maybe, like me, you’ll read the line “I am finding another space in my voice to rise” and feel the sting of tears. I look at this issue and feel like I’ve been part of an emotional journey that’s left me a little bruised, a little broken. But in the next breath, I’m overtaken with “one of those moments that suddenly turns toward you” (Ariana D. Den Bleyker – “My Daughter Buds at Eight and I Buy Her a Bra”) and I feel as if the sun has beaten back the clouds. It was an intentional choice to begin this issue with Susan Odell Underwood’s poem “Psalm” and end it with her poem, “Prayer.” Although we usually keep multiple poems by one poet together, it seemed fitting, even necessary, to allow these poems to act as front and back covers for the issue. In the language of punctuation, perhaps they function like parentheses protectively curving around the collection, “holding (the emotion) so still” as we “learn to ask the circle inside” us. (Amy Poague – “If Ever a Ferris Wheel Held You”) Underwood’s poems are lyrical but not sentimental, sure of themselves and yet, when examined closely, these poems, too, allow for questions. And perhaps that is why they resonate with me. Perhaps that is why, even after reading the faith-filled poem “Prayer” a dozen times, the lines “Faith would never, not for an eternity, have been enough. / You have to witness for yourself.” still wreck my heart. I’m beholden to my fellow editors who have been here daily through this reading period and whose thoughtful and knowledgeable discussion on the poems made my job so much easier. To Jeni, who is making her debut as an RR editor with this issue, and to Christine, Roseann, and Nancy, who have been in it from the start, my gratitude, love, and respect. To Jim Zola, the featured photographer for Issue Three, a mere thank you will never be enough. When I first approached Jim about being involved in Issue Three, he said “I’m in!” Little did he know what he was in for! There’s a lot involved in reading every poem, allowing it to speak, and choosing a piece of photography that engages in the conversation – all within a strict time frame. With some poems, Jim focused on a single phrase or even a single word. With others, he widened his response to include the mood or tone of the poem. To me, the choices were fascinating and I found myself intrigued to see which particular facet in each poem caught Jim’s attention. I have deep appreciation for Jim’s time and effort, and for his contribution in making this issue unique. Finally, to the poets who shared their words and their faith in the power of poetry with us, and to our readers who join in the journey, we are grateful. We see you. We hear you. And we’re glad you’re here. If you wish to order a print copy of Issue Three, you can do so by clicking the red MagCloud link below. Print copies are $18.00 plus shipping. Digital issues for all your devices are free with the purchase of a print issue. Digital copies only are $4.00. For links to individual poems, just click on the poem titles below. Enjoy!